Enner Valencia Transfer Rumors: Pachuca Forward to Newcastle? Enner Valencia could be headed to English Premier League side Newcastle during the summer transfer window. The 25-year-old Ecuador forward has played excellently in World Cup 2014 so far, finding the net three times in Ecuador’s first two World Cup matches against Switzerland and Honduras. According to Metro, Newcastle have opened negotiations with him, and a number of other EPL sides are also interested. Valencia is valued at £7 million ($11.9 million) by his club Pachuca. He scored 18 goals in 23 games last season for the Mexican Liga MX side. Check out an Associated Press article on the Ecuador. RIO DE JANEIRO (AP) — Ecuador coach Reinaldo Rueda hasn’t brought up the name recently, but his team knows who it’s playing for — their late teammate Christian Benitez. There’s also a spot in the final 16 of the World Cup on the line in Wednesday’s match against France. Benitez died almost a year ago of heart failure, a day after playing for his Qatari club. He was the team’s star striker, and his No. 11 has been retired by the national federation. Ecuador is using No. 11 in this World Cup, with the shirt worn by Felipe Caicedo, only because FIFA requires all numbers between 1 and 23 be used. Ecuador needs a victory to guarantee a place in the second round. It was knocked out by England in the round of 16 in 2006. It failed to get out of the group stage in 2002, its first World Cup appearance. France is virtually into the knock-out phase, though it still faces a long-shot mathematical possibility of not making it. Rueda lauded France as a complete team filled with stars at every position, a team playing as well as any in the tournament. 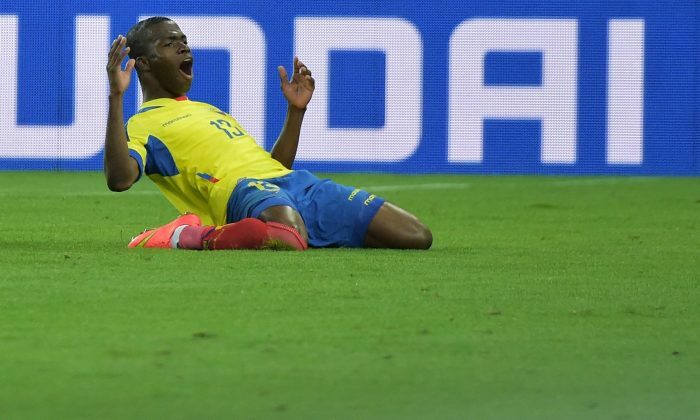 Ecuador will rely on Pachuca striker Enner Valencia, who has scored three goals in two World Cup matches and solidified his spot up front after Benitez’s death. It may also get insider information about Rio’s Maracana stadium from defender Frickson Erazo, who plays for local club Flamengo. “We have the motivation, and there is joy in a match like this knowing it all depends on us if we stay in the tournament,” Rueda said.